A New Orleans-style jazz Memorial Procession (known as the Rooster Funeral) encourages participants to stop at participating Ybor establishments for Mardi Gras themed food & drink specials. A colorful procession of “mourners” will follow behind the casket of James E. Rooster. 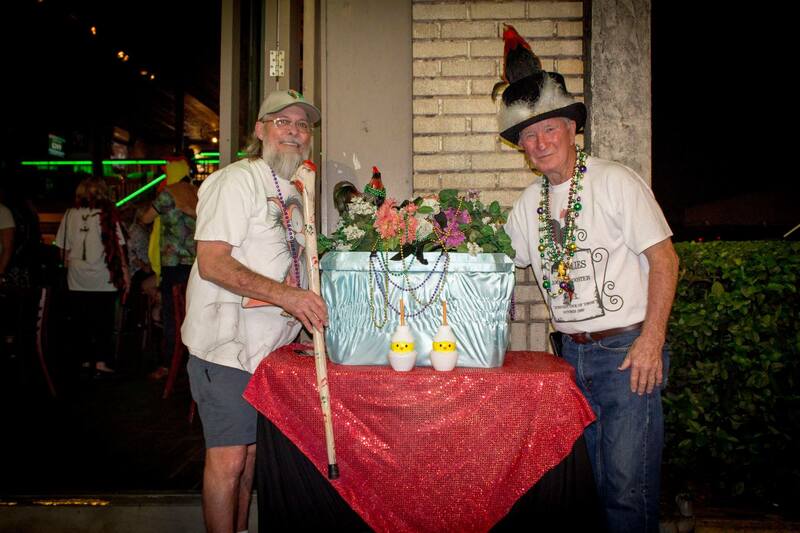 The event begins with a funeral wake to honor James E. Rooster at The Dirty Shame and will be followed by the Chicken Parade along 7th Avenue with stops at Tequillas, The Big Easy, and Bad Monkey! This is a local tradition carried on by the fowl’s former owner, to Tommy Stephens, following the bird’s untimely demise in the jaws of a dog in 1997. Must be 21+. Come dressed to impress! Costumes with a Mardi Gras or chicken theme are highly encouraged as well as an abundance of beads, flowers, and cowbells.